Motala with the adjusted prosethesis. 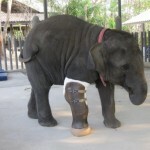 The Friends of the Asian Elephant Hospital, which is written about at the Eyes of Thailand film makers blog, fits a new prosthetic to Baby Mosha. Please not only check out this blog but also the Web site for the Eyes of Thailand film.